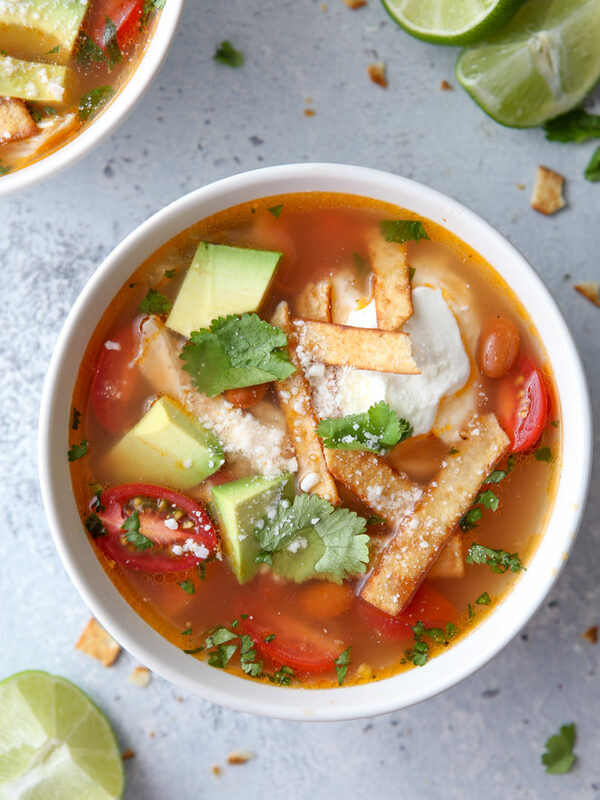 This easy chicken tortilla soup filled with pinto beans, fire-roasted tomatoes and shredded chicken, and loaded up with fresh toppings like avocado and cilantro is one of my favorite comfort meals! I’m trying to share more of the meals I make for my family on here, and one of the first that came to mind is this chicken tortilla soup. It’s super basic, but I make it every few weeks and everyone loves it! This soup couldn’t be easier to prepare, with staples you may already have in your pantry or fridge, and just 20 minutes of work. Keep it simple and serve it with some shredded cheese and a dollop of sour cream, or go all out with toppings like avocado, tomatoes, crispy corn tortilla strips, and fresh lime. What is Chicken Tortilla Soup? 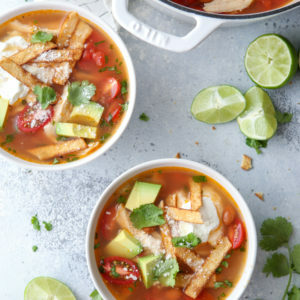 Chicken tortilla soup is a Mexican soup with a tomato or chicken broth base and it’s filled with ingredients like beans, tomatoes, shredded chicken, onions and garlic. Other common additions are jalapeno or other peppers, lime, cilantro, and corn. 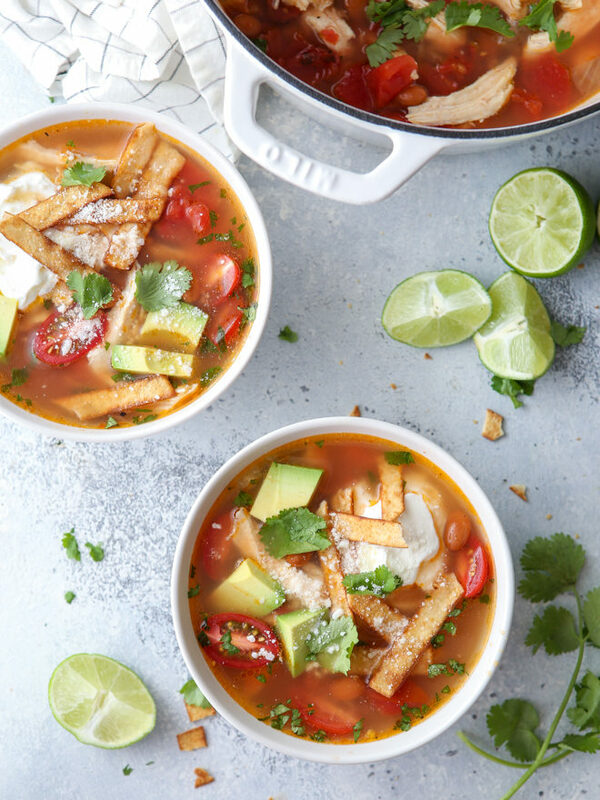 In my mind there’s no way you can go wrong with Chicken tortilla soup, so make it how you like it! Make it spicy, or keep it mild; use only a few ingredients or load it up. Can you make this soup in the slow cooker or instant pot? Yes! My favorite way to make this soup is on the stove because it is so fast, but you can definitely throw it in a slow cooker or instant pot too. 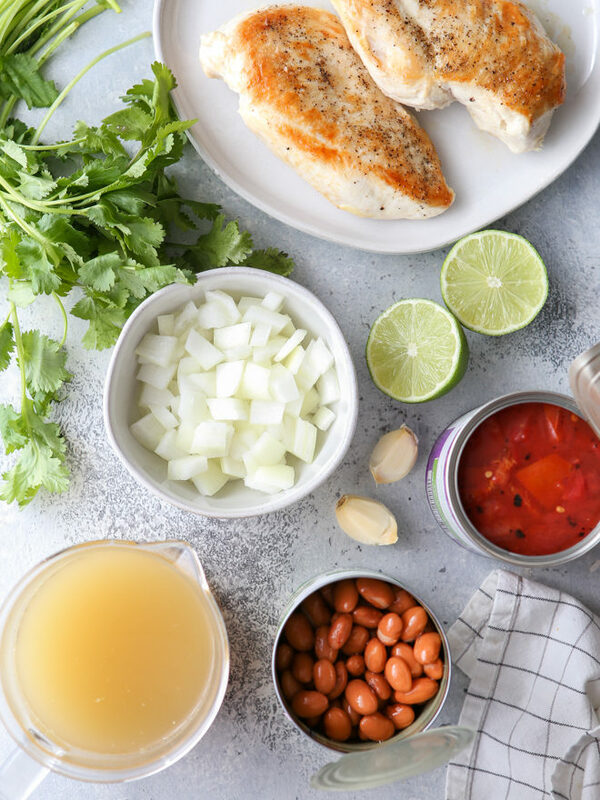 Slow Cooker Instructions: Add chicken, onion, garlic, broth, beans, tomatoes and salt to the slow cooker and cook on high for 3-4 hours or low for 5-6 hours. Shred chicken. Add lime juice and cilantro. Instant Pot Instructions: Set instant pot to saute function. Add oil and brown seasoned chicken on both sides. Remove from instant pot and cook onion and garlic for a few minutes until soft. Add broth, beans, tomatoes, salt and browned chicken to instant pot and cook on high pressure for 5 minutes. Quick release the pressure, then shred chicken and add lime juice and cilantro. This chicken tortilla soup freezes very well, just be sure to freeze it without the toppings (you can add those later). Let the soup cool to room temperature, then freeze it in a heavy-duty ziplock bag or airtight container for up to 1 month or more. To reheat, place in fridge overnight to thaw, then warm on the stove over medium heat until hot. Add olive oil to a large pot and set over medium high heat. Sprinkle chicken with salt and pepper and add to pot. Brown on both sides, then remove from pot and set aside. Add onions to the pot and cook until softened, 3-4 minutes. Add garlic and cook for 1 minute more. Add chicken broth, beans, tomatoes and salt to the pot, along with the chicken. Bring to a boil and simmer until chicken is cooked through, about 10 minutes, but it will depend on the thickness of the breasts. Remove the chicken from the pot and shred with a fork. Add back to the pot, along with the lime juice and chopped cilantro. 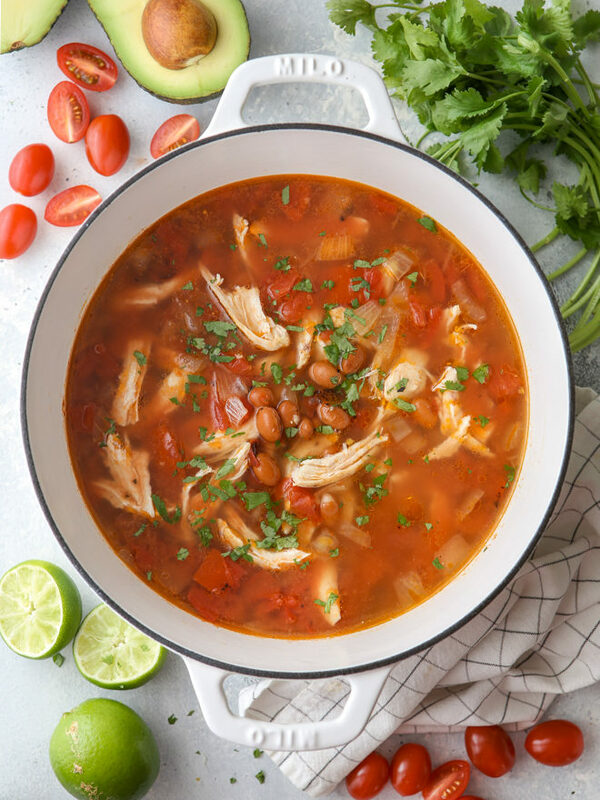 If you have a stash of cooked chicken  on hand, or want to use a rotisserie chicken, skip the first few steps and add about 2 cups shredded chicken to the soup at the end with the lime juice and cilantro.